The How-To Gal: Happy Blogiversary to ME! Today is The How-To Gal's one year blogiversary...can you believe it??? From very humble beginnings, The How-To Gal has grown tremendously in one year and I am so happy to call all of you "fellow beautifiers" my friends. Through successful and failed projects you have been rooting me on. Thank you. To show my bloggy love, I have a great surprise! My sponsor, Photo Jewelry Making has given me a $25 gift certificate to be used on ANYTHING on their website for one lucky winner. SO awesome. Go check out all of the fun kits they have to offer. I posted my favorites HERE. How to enter: Visit Photo Jewelry Making's site, pick what you would use your $25 on and leave a comment on this post. That is IT! No following needed, no reposting of the contest needed (but not frowned upon :) )! So again, visit Photo Jewelry Making and let me know in a comment what you like...simple as that. You have until the end of Sunday, March 28th to enter. I will post the winner on Monday, March 29th. Good Luck to everyone! I like the Mothers Day Large Sterling Silver Dual Sided Photo Necklace Kit and pretty much everything else! I'm a recent follower and have been really enjoying your blog. Thanks for that! I like the photo rings. Have a GREAT day! I like the Make Your Own Scrapbook Photo Necklace Kit Antique. Perfect to make a photo necklace of my baby girl. Happy Blogiversary to YOU and congratulations on the growth of your blog! I like the photo resizing software and a lot of the jewelry, too! I have a photo bracelet that I bought a couple years ago, but haven't gotten pictures to put in it. I love the photo bracelet. So cute! Love the Mother's Day SS Dual Sided photo frame. Happy Blogiversary ! They have LOTS of great stuff, so hard to choose. I like the Mothers Day Large Sterling Silver Dual Sided Photo Necklace Kit - so sweet! I really like the mega circle collage pendant kit. Congrats on making it a year! Here is to many more! And thanks for the giveaway, I'd get a make your own rectangle pendant kit. I would get the type writer keys bracelet kit!! Love it!! "Make Your Own Glass Top Rectangle Pendant With Bail and Necklace Kit." Fun site! I really like the deep silver pendants with glass covers. The photo bracelets are fun too. Happy Blogiversary! I headed over to Photo Jewelry Making and I really like everything! 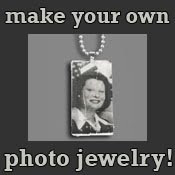 If I have to choose just one item it would be the Sterling Silver Photo Necklace Kit. I never knew this company existed...yeay for Christmas shopping (a bit early). Thanks for the chance to win! Happy anniversary! I would love any of the photo keychains. I love having my brood with me all the time. I think I would use the gift certificate on one of the home business kits. My son is in karate, and I bet lots of the tournament moms would love some pendants of their kids. I'd love one of these: Black Onyx Color Bracelet Kit w/ 6 EZ Change-Itz™ Photo Charms. It's perfect for the MIL! Thanks for the giveaway & HAPPY BLOGIVERSARY!! !